I’ve been hitting the bottle for about 8 years now. 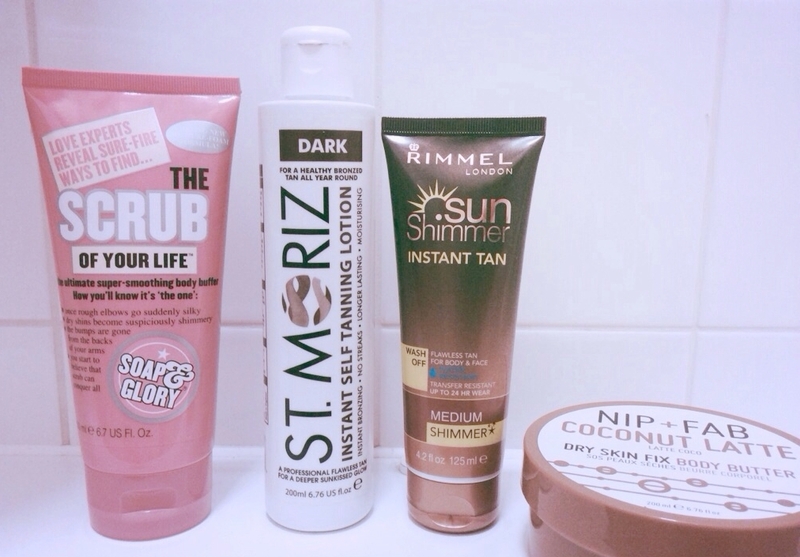 Fake tanning is like an evening ritual for me; it’s a lengthy procedure, but I couldn’t live without it. But why don’t I just embrace my natural skin? Because quite frankly, I’m naturally as white as a sheet. No, I don’t suit it, and I’m not comfortable with being so pale I look transparent; which leads me to the other common question; why don’t I just use the sunbeds? Because my pasty skin is scared of sunlight; I’m so fair I could brave the UV lights for just 6 minutes and I’ll come out looking like a tomato. (And no, it doesn’t develop into a tan.) Not only that, as well as the obvious skin cancer risk I will do anything to keep my skin looking youthful, and I don’t want to end up looking like a leather handbag when I’m 30. When my tan starts to look patchy from the week before I’ll hop in the shower and use an exfoliant; I’ve just finished using Soap & Glory’s Flake Away so I’ve moved onto using their The Scrub of Your Life. They both have their signature Pink scent however I prefer the Scrub of Your Life as it’s in a tube as opposed to Flake Away; the water from the shower seems to end up in the tub which I find a bit gross! – This is an important step to tanning as it gets rid of all of the dead skin and it helps to lift off the tan from the previous week. – I like to use a cleansing body cream because it creates a good lather to lift off the tan and it’s also gentle enough to my skin so I’m not feeling red raw after a lot of harsh scrubbing. Once I’m all rinsed off and out of the shower I’m left with nice, silky smooth skin. I usually like to give my skin a night off from tan and just moisturise but if I don’t have time and I’m needing some colour for a night out, for example, I’ll move straight onto tanning. I’ve used so many gradual fake tans over the years; from starting out with Johnson’s Holiday Skin Body Lotion (which was streaky, gave me yellow skin and smelled awful the next day) to my days of having a full-time job and being able to afford a luxury bottle like Xen-Tan Dark Lotion, I’ve tried plenty. My all time favourite is the latter; Xen-Tan gave me the perfect colour; olivey bronzed skin and no overwhelming smell of biscuits on my bed sheets. The smell is there a little, but it would be a miracle to find a fake tan that doesn’t have it. Being at uni I’ve turned to the budget-friendly St Moriz. 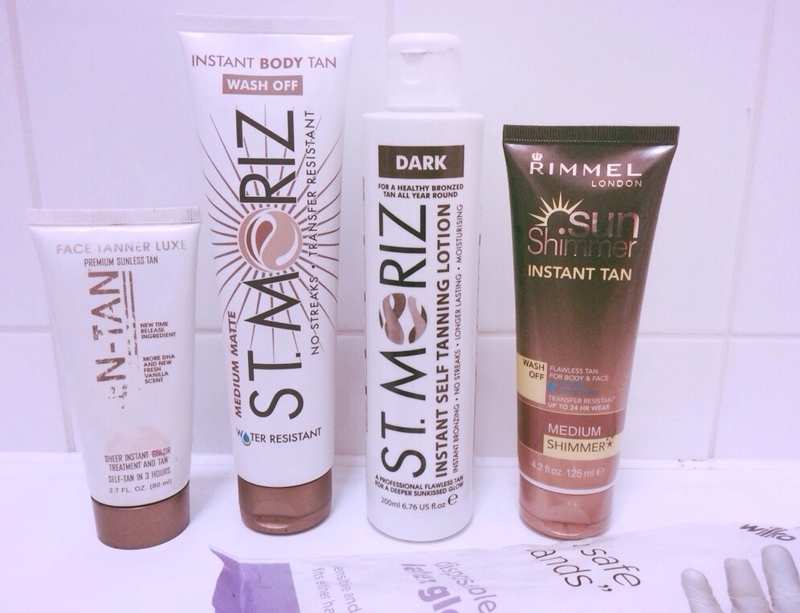 I’ve tried the Self Tanning Mousse and I found it far too drying on my skin, although its benefit is the drying time. I’ve used St Moriz Dark Lotion for the past year and a half, and I’ve found it’s a good dupe for my beloved Xen-Tan. Yes, the biscuity smell the next day is rather bad, however for £2.99 I can’t really complain. When it comes to my hands and face I’ll use Xen-Tan’s Face Tanner Luxe which is less pricey than the regular lotion (however still rather expensive therefore I don’t use it often) and is gentle on my face. I pop it on my hands as well so they don’t end up scarily dark! 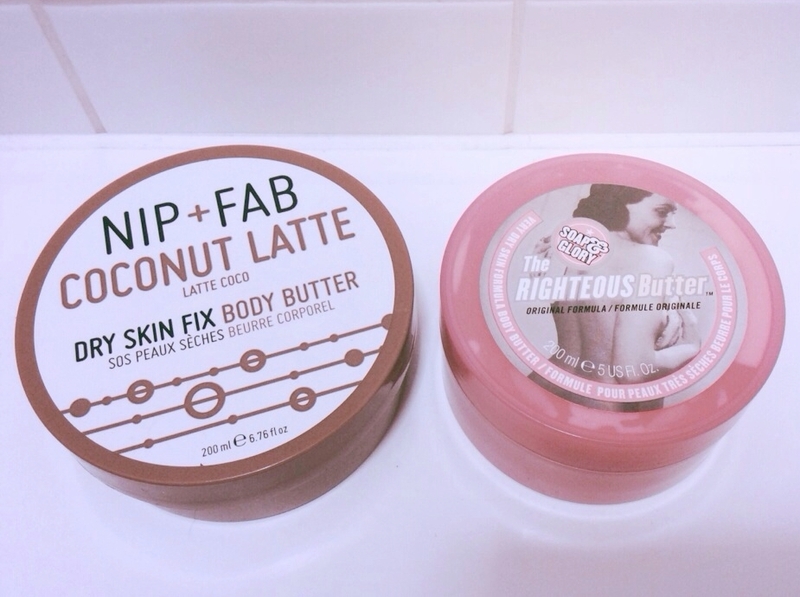 I have two favourite moisturisers I use to keep my tan lasting as long as possible; Nip & Fab’s Dry Skin Fix Body Butter in Coconut Latte and my old faithful, Soap & Glory’s The Righteous Butter. They are both very moisturising, leaving my skin soft and silky, and to top it off, smell delicious. The skin colour on my chest is naturally a lot lighter than the rest of my body and to even it out if it’s on show during the day I will use St Moriz’s Instant Wash Off Tan in Medium. I also like to use this all over for a night out or special occasion to enhance my tan and I can happily wash it off the next day if I’m feeling too dark. My other all-time favourite is Rimmel’s Sun Shimmer in Medium Shimmer. This gives me a gorgeous shimmery glow and gets used to death when summer comes round and my legs are out more often. So that’s it! A week later and I’ll be back to exfoliating and tanning all over again; I’m so used to doing it it’s no hassle for me, and I always feel happier and confident with a glow. Previous Post My first time… Waxing or Threading?